Enterovirus-D68 is one of dozens of non-polio enteroviruses (NPEVs) that circulate primarily during the summer and fall, and cause between 10 and 15 million (mostly) mild respiratory illnesses in the U.S. each year - primarily in children. Perhaps most notorious is EV-71, which has caused major outbreaks particularly in Asia and the South Pacific over the past couple of decades (see ECDC: Rapid Risk Assessment On Recent Enterovirus Outbreaks In Europe), and has been making inroads into Europe the past few years. But in recent years another NPEV - EV-D68 - has been on the rise as well. First discovered in 1962, this virus kept a relatively low profile until the middle of the last decade. 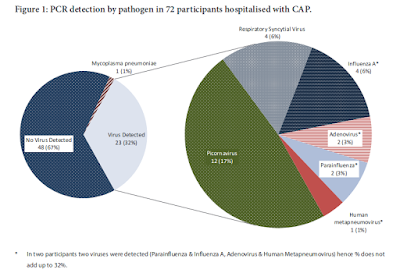 In 2011, in MMWR: Clusters Of HEV68 Respiratory Infections 2008-2010, we looked at a half dozen EV 68 associated clusters which occurred in Asia, Europe, and the United States during 2008--2010. In August of 2014, EV-D68 abruptly appeared in America’s heartland and quickly spread across the nation, causing a wide spectrum of respiratory illness, predominantly in young children and adolescents (see Kansas City Outbreak Identified As HEV 68). Coincident with this outbreak doctors reported a rise in cases of neurological illness presenting with AFP (acute flaccid paralysis) or limb weakness – often associated with a recent respiratory illness – mostly in children. While not conclusive, the evidence for a link between EV-D68 infection and AFP has grown stronger over the past couple of years (see EID Journal Enterovirus D68 Infection in Children with Acute Flaccid Myelitis, Colorado, USA, 2014). There are, however, many other viruses - including EV-71, West Nile Virus, cytomegalovirus and Epstein-Barr virus, and adenoviruses - that can cause similar neurological symptoms. After reporting no EV-D68 cases in 2015, the CDC is reporting sporadic cases again this summer across the United States, as announced on the CDC's About EV-D68 page. What is happening with EV-D68 in 2016? CDC is aware of limited sporadic EV-D68 detections in the U.S. in 2016. There is no indication of unusual activity. Enteroviruses are ever-present in the community, and each year we expect to detect cases. As in previous years, CDC will continue to work in 2016 with states by testing specimens to determine virus type, supporting the identification and investigation of outbreaks, and monitoring seasonal activity. Perhaps coincidentally, the CDC is also reporting an increase in AFP diagnoses over the past few months. At least compared to 2015. As of now we've no information definitively linking this increase to any specific cause. Late last month we also looked at a report out of Taiwan (see Taiwan CDC: 1st Case Of EV-D68 With Acute Flaccid Paralysis). All of which brings us to a Rapid Communications published on Friday in the EID Journal on a marked increase in EV-D68 cases in the Netherlands over the summer, which they attribute to clade B3 of the virus. EV-D68, like all viruses, continues to evolve. The clade that struck the United States in 2014 was identified as clade B1 (see CIDRAP On The Lancet EV-D68 Analysis, which emerged around 2010. Whereas the virus detected this summer in the Netherlands has been pegged as clade B3, which was first detected in China and Taiwan in 2014 (see Molecular evolution and the global reemergence of enterovirus D68 by genome-wide analysis). You'll want to follow the link below to read the full report, as I've only excerpted some highlights. In June and July 2016, we identified 8 adults and 17 children with respiratory enterovirus D68 infections. Thirteen children required intensive care unit admission because of respiratory insufficiency, and 1 had concomitant acute flaccid myelitis. Phylogenetic analysis showed that all of 20 sequences obtained belong to the recently described clade B3. The largest enterovirus D68 (EV-D68) outbreak occurred in the United States during the summer and fall of 2014. Approximately 1,100 respiratory EV-D68 infections were recorded, mostly in children, many of whom required intensive care unit (ICU) admission. Most diseases were of respiratory nature, but concurrent with the upsurge of EV-D68, the Centers for Disease Control and Prevention (Atlanta, GA, USA) recorded 120 cases of acute flaccid myelitis (AFM) (1). A Europewide study identified circulation of EV-D68 during the same period. Although numbers were lower, ICU admissions and 3 cases of AFM were reported (2). Before 2014, only a few small outbreaks of EV-D68 had been described worldwide, all with respiratory infections. Our clinical virology laboratory (University Medical Center Groningen, Groningen, the Netherlands) reported an increase of EV-D68 infections in 2010 and again in 2014, in parallel with the US outbreak (3,4). Very limited activity of EV-D68 was observed in 2015. Since June 2016, we have again identified a substantial increase in respiratory EV-D68 infections in our hospital, just 2 years after the previous upsurge. To raise awareness of this upsurge and the severity of EV-D68 infections, we report on 25 cases. In addition, we show the phylogenetic relationship between the 2016 EV-D68 strains and those that circulated in 2014. Evidence that EV-D68 might cause AFM is increasing after recent epidemiologic investigations (1,11,12). In patient 16, atypical Guillain-Barré syndrome initially was diagnosed; however, this diagnosis was later discarded because the electromyography results indicated motoric axon or anterior horn cell disease, and the clinical picture and MRI results were in favor of AFM (13). MRI findings were subtle, and radiologic diagnosis was made only after further review and discussion of the case with the neurologists. The absence of EV-D68 in CSF is consistent with previous reports (1,12). Sequencing results showed that the strains in our study cluster in the recently described clade B3 (8). During the 2014 outbreak, most EV-D68 sequences belonged to clades B1 and B2, although A1 and A2 were also represented (2,14). Larger epidemiologic and genotyping studies are needed to evaluate whether the distinction within clade B is tenable and whether our clinical findings are typical for subclade B3. This upsurge could indicate an active EV-D68 season, as highlighted by the epidemiologic curve, with a potential increase in AFM cases. Clinicians should be alert for EV-D68, its clinical implications, and the need for appropriate diagnostics, particularly in children who are admitted with respiratory failure to the ICU or with possible symptoms of AFM. Dr. Knoester is an attending physician in clinical microbiology at the Division of Virology, University Medical Center Groningen. Her research focuses on clinical virology and epidemiology.